At the intersection of multiple disciplines and cultures, Urbanvessel forges new connections, reflects contemporary life, and subverts social assumptions. Centred in the power of the human voice, Urbanvessel‘s creative works aim to alter our audience’s perspective on their world. Urbanvessel creates new performance works through interdisciplinary collaboration. Rooted in music and sound, the power of the human voice is at the heart of our creative process. 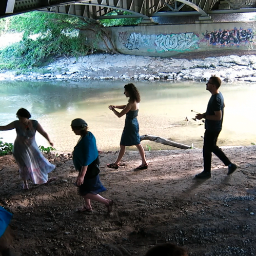 Led by Artistic Director Juliet Palmer and drawing upon the diverse talents of our collaborators, Urbanvessel fuses sound, music, text, imagery and movement. Urbanvessel shares knowledge through our educational programmes and community outreach activities. Urbanvessel‘s works are inspired by disparate impulses: from sound, politics, fetishes, history and ritual, to poverty, architecture, music and sports. Our creative response to the source material is filtered through an inclusive feminist perspective. A new interdisciplinary team is formed for each project, organized horizontally so that artistic decisions are made collaboratively. Our methodology combines improvisation and composition in tandem with an inclusive process for critical feedback and revision. Urbanvessel was founded in 2006 by Palmer and architect Christie Pearson. Works include: VOICE-BOX (Harbourfront World Stage 2010, Fresh Ground New Work commission); STITCH (Freefall Festival/World Stage 2008); SLIP for the Harrison Baths (X Avant Festival, Toronto 2006); SLIP (2008 BRAVO Fact! film); and THE PROVINCE OF IMPOSSIBLE (Voice++ Festival, Open Space Arts, Victoria 2007; Sound Symposium 2008; Ottawa Chamber Music Festival). Urbanvessel Performing Arts Inc. is an Incorporated Non-Profit Organization.